Sew Serendipity: New Spring Collection: Meet the Girls of Fashion Formula Dresses! New Spring Collection: Meet the Girls of Fashion Formula Dresses! Yet another reveal of the Spring Collection.....Fashion Formula Dresses! Yes, I wrote DRESSES! After the popularity of my two Fashion Formula skirt booklets, I began to think about whether I could do the same thing with dress designs. After much trial and error, a LOT of math, thinking, sewing, and tinkering, I came up with three great dress designs for you! This is a full size booklet....28 pages, 8 1/2" x 11" in size, with a large pull-out sheet in the center for the hand embroidery. There are NO PATTERN PIECES......well, none that are included anyway. I am teaching you how to take custom measurements and make your own bodice! It may sound intimidating, but it really is easy to do and results are amazing. I give you a measurement chart to go by, but I really recommend that you go ahead and measure anyway. There are some measurements that may vary from one person to another and I want you to have the best fit possible. So, let's meet the girls! First up is Maria. 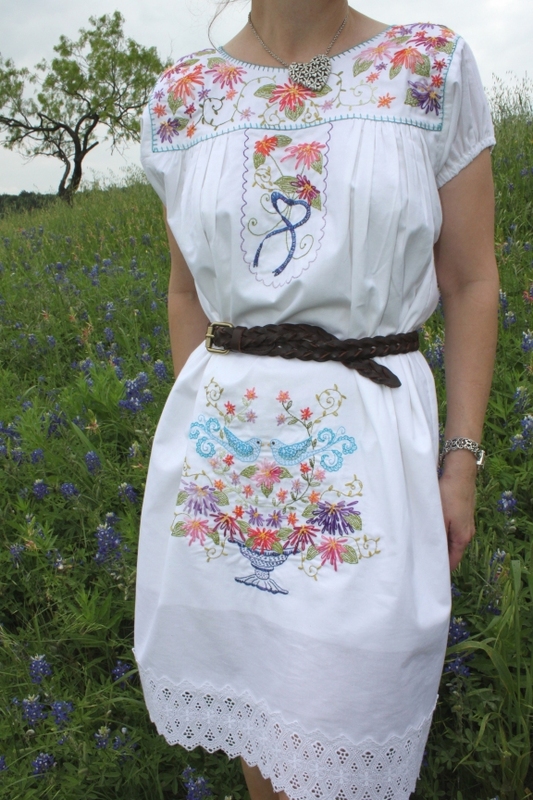 This design is based on the traditional Mexican folk dress. There are only three measurements to take and the fit is loose and easy. You can choose to wear this dress with or without a belt. I personally prefer the belt, but it looks great without also. 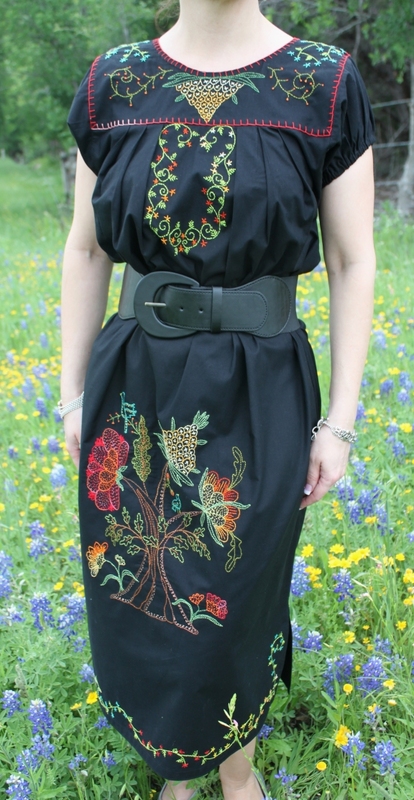 I mainly wanted to include this style of dress so I could go crazy with hand embroidery which is all the rage right now. It was so much fun to come up with the designs and then watch them come to life as the stitches went in. I love playing with color, so this was paradise for me! I know what you are thinking....wow, doesn't that hand work take a long time? Well it isn't fast, but the end result is so pretty it is worth every minute. For this design, I give you two options for the length and you can opt to pleat or gather the skirt onto the bodice. The dress goes together super fast so you can get down to the hand work. These dresses were made up in the new Michael Miller Cotton Couture fabrics. They are so smooth and soft. What a pleasure to stitch with! The next dress is the Paige Pillowcase Dress. Yes, this is sort of a pillowcase dress, but for grown-ups! You need a few more measurements to create this bodice, but again I walk you through the whole process and it is easy once you get the hang of it. This dress has a tie that gathers up the upper bodice for a nice custom fit at the neckline and underarms. You can opt to have the tie at the left side front or center back. There are also lots of options on the skirt style, length, and extra little details for contrasts, ruffles, hembands, etc. Don't forget about those wonderful border prints....I love the way they get to be showcased here without any interruption to the fabric. The last dress is the Veronica V-Neck Sundress. Once I had designed Paige, I began to wonder if I could play around with the front bodice to make a V-neck style. It took a bit of work, but I managed to work something out that will be easy for you to follow. This dress has so many possibilities! You can actually interchange all of the skirt styles between Veronica and Paige, so your options are many. These dresses are just so perfect for the summer....easy sewing with a comfortable and flattering fit. The beauty of the ties at the neckline are that once you have them as you like, the dress will pull over your head easily without having to untie a thing! And because there is elastic at the high waistline, the fit is super comfortable. I know I will be wearing these a lot throughout our hot summer to come here in TX! I am expecting the stock to arrive about the middle of next week (May 10th or so). I will post here and to Facebook when we have them up and ready for sale!! This booklet will be $16 for three unique dress designs, lots of design options, and all the tips you will need for measuring yourself with great success!! Market Recap, Purse Palooza, AND a Giveaway! New Designs in the House!